This page will provide you with information about the removal of benign skin lesions. For further details, please speak to your consultant. A skin lesion is a lump located on your skin, or just below it. Types of skin lesions can include moles, skin tags, lipoma and epidermoid cysts. Surgery is the only dependable way of removing skin lesions, although you may decide to simply leave them as they are. Taking only 15 to 25 minutes, the type of incision depends on the lesion. When removing an epidermoid cyst, for example, the surgeon will make an oval cut over the cyst before surgically removing it (see Figure 1). 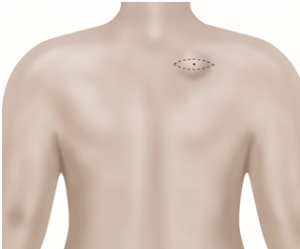 When removing a lipoma, a straight incision will be made onto your skin, directly over the lipoma. It will then be released from the tissue and taken out. A skin tag can easily be removed by numbing the area with local anaesthetic, and when removing a mole, an incision will be made all the way around it using an elliptical cut. You should be able to go home shortly after the operation. You may return to work the next day, unless your type of work puts a particular strain on the stitches. It is rare for these procedures to prevent you from carrying out day-to-day activities. Skin lesions are not unusual, and can be quickly and easily treated by a simple operation.